Photo: "Plafond" - a huge monolithic crystal of gypsum. Some crystals reach one meter in section. So, caves. The fairy, fantastic world absolutely not similar to in what we live. How much legends, myths connected to them peoples of the world. Ancient Greeks identified an entrance in a cave with an entrance in an empire dead. Behind it in the underground world of the person met the terrible dog Cerberus with three heads, oblivion ice stream Stiks and the hell river Aheront with carrier Haron which transported only "there", and never "back" . Under the ground has placed a hell and christian religion. The entrance in hell was drawn as a cave with an inscription: " Give up hope, entering here anybody! " But we shall leave myths which were natural consequence of knowledge of a nature. We shall meet more close caves. For today on the planet it is discovery already many tens thousand diversified caves. Caves are formed mainly by influence alkali or washout of limestones, gypsumes, dolomite etc. easy instant rockes. You can meet also ice and hydrochloric caves. On our planet the system of caves Mammoth - Flint Ridge (state of Kentucky, USA) has the biggest extent. General extent of passages more than 500 kilometers. There is the biggest cave hall in the Karlsbatky cave (USA). 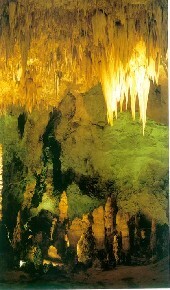 It is long about 1200 m., the width reaches 190 m., height - 91,5 m. Volume of this grotto about 20 000 000 cubic metres. There is most high-mountainous cave "Rakiot" in India. The entrance is located at height of 6600 m.
Beauty of caves cannot be described or passed by means of a photo or a film. It should be seen: crystals which at illumination shine all colors of a rainbow, similarly to the Ural semi-precious stones; gardens from stalagmites of the most simple up to the most freakish forms; trailing garlands of stalactites; walls, ceilings covered with hoarfrost of multi-colour crystals; the walls polished with water, of the diversified coloring; multi-colour minerales on the walls; underground lakes, the rivers, falls... Yes, it should be seen!